Black Friday may have notched a new holiday sales record this year, but it's too soon to say whether the sales momentum will continue throughout the holiday season. NEW YORK (CNNMoney) -- Even though shoppers showed up in droves and spent a record amount of money over Black Friday weekend, it's still too early to tell whether that holiday sales momentum will continue through Christmas. Total spending over the four-day weekend, which now includes Thanksgiving, reached a record $52.4 billion, up 16% from $45 billion last year, according to a survey by the National Retail Federation released Sunday. More shoppers showed up as well. A record 226 million consumers visited stores and shopped online between Thursday and Sunday, up from 212 million last year. "It's clearly a great start to the season but we still have five weeks until Christmas" said Sherif Mityas, partner in the retail practice of A.T. Kearney, a New York-based consulting firm. "The ability of retailers to keep up the momentum is the key," Mityas added. "Retailers have to get people back in the stores and back online after this weekend." The deep discounts that brought consumers out as early as 9 p.m. Thursday and into the wee hours of Black Friday morning, does not guarantee that they will return, he said. And the fact they spent more while shopping doesn't guarantee that they'll continue to spend in the weeks ahead. 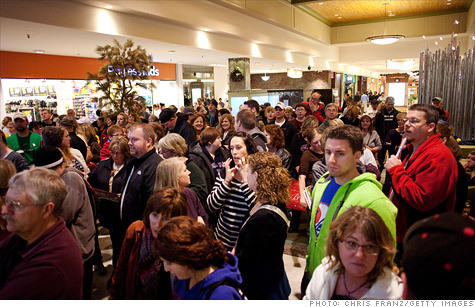 Between Thursday and Sunday, holiday shoppers shelled out a record $398.62 each. That's the most since 2008 when shoppers coughed up $372.57 on average. However, that bright start to the 2008 holiday shopping season was then followed by a steep slump in spending as many shoppers sat the rest of the season out. In fact, 2008 turned out to be one of the worst holiday seasons on record, with consumers' concerns about the economy ultimately crushed their shopping spirits. That year, the NRF had expected holiday sales to increase 2.2%, but the end result for November and December combined was a much worse decline of 2.8%. "Black Friday is only one piece of the puzzle," noted NRF spokeswoman Ellen Davis. "You could have the best Black Friday in the world but the rest of the season wouldn't match up and that's what happened in 2008." Typically, sales over Black Friday weekend comprise 10% of total holiday sales. But, in 2008, experts believe many consumers rushed out during Black Friday weekend to take advantage of the best bargains then hunkered down for the rest of the season. "A lot of people went out as a result of desperation because they knew the deals were really good," Davis said. "In some ways, the economic environment is very similar to 2008 but shoppers are acting very differently." Rather than stocking up on discounted necessities like small appliances and basic clothing like they did three years ago, this Black Friday, consumers are making more discretionary purchases, like jewelry, toys and sporting goods, which bodes well for the season overall, she explained. But even since the recession ended, concerns about the job market and depleted retirement accounts continue to weigh on most consumers. Only 13% of Americans feel more secure in their jobs now than one year ago, according to a survey released Monday by Bankrate.com. "The strong holiday sales figures thus far underscores how bargain conscious American consumers still are and it doesn't guarantee those strong results will hold over the next several weeks," said Greg McBride, Bankrate's senior financial analyst. "Consumers are still worried about their savings, job security, debt and net worth," he said. In the same survey, 42% of Americans said they intended to spend less this holiday season compared to last year, while only 10% of Americans said they would spend more. As of Monday, the NRF said it is sticking with its earlier forecast for overall holiday retail sales to increase 2.8% during the months of November and December to $465.6 billion. Even if that projection holds true this time, that's not enough reason to celebrate a successful holiday sales season, Mityas said. "Three percent growth is good but you're not popping champagne corks," he said.